Jouer dans les règles de l'art : la clé du succès et du vrai plaisir! Jeune sport équestre d'origine française (1970) dans sa forme férératrice et réglementée, le jeu est simple et spectaculaire! d’environ 30 X 65 mètres pourvu de deux paniers. Pour marquer un point, le ballon doit être lancé dans un cerceau après que les joueurs se soient fait trois passes. et tout en se penchant sur le côté de son cheval, au trot ou au galop (obligatoire lors de la mise en jeu). En compétition, le tout se fait à une vitesse parfois enlevante et rend ce sport très spectaculaire et aussi prisé du public que des joueurs! Sur le plan international, on compte 20 000 joueurs et joueuses de horse-ball sur la planète. Actuellement, la Fédération Internationale de Horse-Ball maintient ses efforts pour faire de cette discipline un sport olympique. Au Québec*, le horse-ball a vu le jour en 2004. Une dizaine d'équipes officielles ont vu le jour ces dernières années, dont certains membres constituent aux diverses coupe du monde, l’équipe nationale (Team Canada). On compte notamment celles d’Hemmingford, St Marc sur Richelieu, de Ste Sophie, Des Cow-boys de Tremblant, et des Centaures de Mascouche. Comme en tout, certaines équipes se défont, d'autres se reforment! De plus, certains poneys-clubs tentent d’initier les jeunes cavaliers à ce sport collectif attrayant. L’association de Horse-ball a effectué au Québec une vingtaine de démonstrations lors d’événements équestres majeurs de la saison 2005. Nous effectuons plusieurs cliniques dans différentes écuries situées un peu partout à travers le Québec, ainsi qu’à l’Institut Technologique Agricole de La Pocatière. * Nous restons modestes et découvrons peu à peu les techniques, car nous sommes pionniers dans cette discipline équestre en Amérique du Nord ! 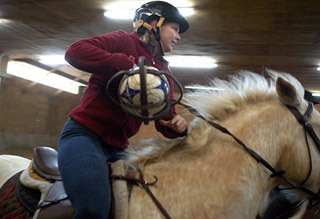 Pato (sometimes called "horseball") is a game played on horseback that combines elements from polo and basketball. It is the national game of Argentina. Pato is Spanish language for "duck", as early games used a live duck inside a basket instead of the ball. Accounts of early versions of pato have been written since 1610. The playing field would often stretch the distance between neighboring estancias (ranches). The first team to reach with the duck to its own casco (ranch house) would be declared the winner. Pato was forbidden for several periods due to the violence—not only to the duck; many gauchos were trampled underfoot, and many more lost their lives in knife fights started in the heat of the game. In 1796, a Catholic priest insisted that pato players who die in such a way should be denied Christian burial. Government ordinances forbidding the practice of pato were common throughout the 19th century. During the 1930s, pato was regulated through the efforts of ranch owner Alberto del Castillo Posse, who drafted a set of rules inspired by modern polo. The game gained legitimacy, to the point that President Juan Perón declared pato to be the national game in 1953. 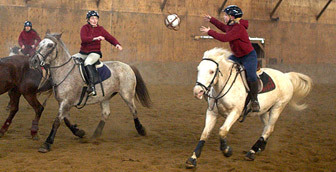 In modern pato, two four-member teams riding on horses fight for possession of a ball which has six conveniently-sized handles, and score by throwing the ball through a vertically positioned ring (as opposed to the horizontal rim used in basketball). The rings have a 100 cm diameter, and are located atop 240 cm high poles. A closed net, extending for 140 cm, holds the ball after goals are scored. The winner is the team with most goals scored after regulation time (six 8-minute "periods"). The dimensions of the field are: length 180 to 220 m, width 80 to 90 m. The ball is made of leather, with an inflated rubber chamber and six leather handles. Its diameter is 40 cm (handle-to-handle) and its weight is 1050 to 1250 g.
The player that has control of the pato (i.e. holds the ball by a handle) must ride with his right arm outstretched, offering the pato so rival players have a chance of tugging the pato and stealing it. Not extending the arm while riding with the pato is an offense called negada (refusal). During the tug itself, or cinchada, both players must stand on the stirrups and avoid sitting on the saddle, while the hand not involved in the tugging must hold the reins. The tug is usually the most exciting part of the game. Pato is played competitively and also by amateurs, mostly on weekend fairs which usually include doma (Argentine rodeo). Buzkashi (from persian, "buzkashi" means buz = "goat" + kashi ="drawing") is a traditional Afghan sport, played from horseback. The name translates literally to "goat grabbing", implying that the game originated in the ancient practice of horseback goat-nabbing during the times of Aryans. The Aryans were skilled -riders who could swoop up a goat while riding a horse at full gallop. The goal of a Buzkashi player is to grab the carcass of a calf, and then get it clear of the other players, or pitch it across a goal line. Competition is typically fierce, as other players may use any force short of tripping the horse in order to thwart scoring attempts (though the use of knives or guns is discouraged). Riders usually wear heavy clothing and head protection to protect themselves from players' whips and boots. Games can last for several days. The game consists of two main forms: Tudabarai and Qarajai. Tudabarai is considered to be the simpler form of the game; in this style, the goal is simply to grab the calf and move in any direction until clear of the other players. In Qarajai, players must carry the carcass around a flag or marker at one end of the field, then throw it into a scoring circle at the other end. The calf in a Buzkashi game is normally beheaded, disemboweled and its limbs cut off, then soaked in cold water for 24 hours before play to toughen it. Occasionally sand is packed into the carcass to give it extra weight. Players may not strap the calf to their bodies or saddles. Though goats are used when no calf is available, calves are less likely to fall apart during the game. Serious Buzkashi players train intensively for years, and many of the masters (called chapandaz) are over forty years old. 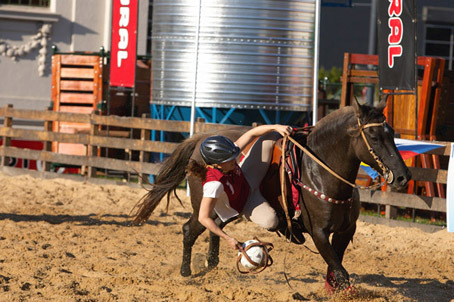 Playing well also requires specially trained horses that know to stop still when a rider is thrown, and to gallop forcefully when their rider gets hold of the calf. These horses can sell for as much as $US 2,500. A game of Buzkashi is featured in an early scene of Rambo III. The game is also a key element in the book Caravans by James Michener and the film of the same name staring Anthony Quinn. A scene from the film featuring the King of Afghanistan watching a game is in fact Mohammed Zahir Shah. The whole sequence of the game being witnessed by the king was filmed on the Kabul Golf course where the national championships were played at the time the film was made." Soutenues par la FEQ, Desjardins et plusieurs députés, dont les députés Luc Thériault de Masson, André Chenail de Hundington et Lucienne Robillard de Westmount, Scarlett, Émilie et Samuelle (Numéros 2, 4 et 7 de l'équipe) organiseront également plusieurs cliniques publiques de démonstration et d’apprentissage en 2007, 2008 et 2009. Site réalisé et mis en ligne le 1er Février 2006. Dernière mise à jour janvier 2012- Tous droits réservés © 2005-20012.